After much fanfare, the Royals have optioned right-handed pitcher Yasuhiko Yabuta to Triple-A Omaha yesterday. Yabuta’s bullpen spot was filled by right-hander Robinson Tejeda, claimed off waivers from the Texas Rangers on Tuesday. Yabuta was brought in as a setup man, but ended up throwing middle relief where he had a 1-3 record with a 5.46 ERA in 26 games. The 35 year old Yabuta signed a two year contract last year for $6 million with an option in 2010 for $4 million. 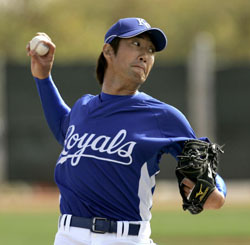 Yabuta came to the Royals after pitching twelve years with the Chiba Lotte Marines in the Japanese Pacific League.